§ 1. Side by side with the establishment of Christianity as the religion of the Roman empire, there appeared a fully developed plan for places of Christian worship. The normal Christian church of the fourth century of our era was an aisled building with the entrance at one end, and a semi-circular projection known as the apse at the other. The body of the building, the nave with its aisles, was used by the congregation, the quire of singers occupying a space, enclosed within low walls, at the end nearest the apse. In the apse, raised above the level of the nave, was the altar, behind which, ranged round the wall, were the seats for the bishop and assistant clergy. This type of church, of which the aisled nave and the apse are the essential parts, is known as the basilica. The name, employed to designate a "royal" or magnificent building, had long been applied to large buildings, whether open to the sky or roofed, which were used, partly as commercial exchanges, partly as halls of justice. It is still often said that the Christian basilicas were merely adaptations of such buildings to sacred purposes. 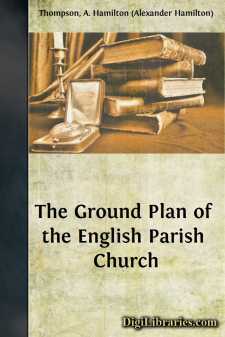 Some of the features of the Christian plan are akin to those of the secular basilica. The apse with its semi-circular range of seats and its altar reproduces the judicial tribune, with its seats for the praetor and his assistant judges, and its altar on which oaths were taken. The open galleries, which in some of the earliest Christian basilicas at Rome form an upper story to the aisles, recall the galleries above the colonnades which surrounded the central hall of some of the larger secular basilicas. Again, the atrium or forecourt through which the Christian basilica was often approached has been supposed to be derived from the forum in connexion with which the secular basilica was frequently built. § 2. However, while the atrium of the Christian basilica is merely an outer court, the secular basilica, when planned, like the Basilica Ulpia at Rome, with direct relation to a forum, was a principal building in connexion with the forum, but not a building of which the forum was a mere annexe. Further, when we begin to seek for a complete identification of the Christian with the secular basilica, we are met by the obstacle that the secular basilica had no fixed plan. If we try to trace any principle of development in its plan, we find that this development is directly inverse to that of the Christian basilica. The secular basilica, in earlier examples a colonnaded building with its central space open to the sky, became at a later time a roofed hall, either, as in the case of the basilica at Trier, without aisles, or, like the basilica of Maxentius or Constantine in the Roman forum, with a series of deep recesses at the side, the vaulted roofs of which served to counteract the outward pressure of the main vault. The Christian basilica, if it were a mere imitation of this type of building, would follow the same line of development; but, as a matter of fact, the highest type of Christian church is always a colonnaded or aisled building. And, even if the Christian apse derived its arrangement from the apse or apses which projected from the ends or sides of the secular basilicas, there is again a difference. The apse with its altar was the main feature of the interior of the Christian church: it was the place in which the chief rite of Christian worship was performed before the eyes of all. In the secular basilica the apse was devoted to special purposes which set it apart from the main business of the body of the building: it was an appendage to the central hall, not necessarily within view of every part of it. In fact, the relation of the apse to the main building was totally different in the two cases.